Thanks "OpalRose" does Flex affect Hypopneas ? Should I wait to turn it off now or wait a couple days like the min. pressure? Do most users turn off the Flex on there Dreamstations? (06-22-2017, 03:49 PM)Scott C. Wrote: Thanks "OpalRose" does Flex affect Hypopneas ? Should I wait to turn it off now or wait a couple days like the min. pressure? Do most users turn off the Flex? Flex is a comfort feature, as is EPR on ResMed machines. Not real sure if using Flex affects Hypopneas one way or another. In my case, with a setting of 3, I experienced more CA's. Everyone is different, so judge by how you feel. Some folk do better using a pressure relief setting and some do better without. I would wait a few days and see how it goes. It takes time to get your settings dialed in, so be patient. I know...easy to say. Good to hear you're sleeping better. You're close now. I know the EPR is a "comfort setting" but it does affect therapy for some people, I sleep like crap when I turn it down. Don't you wish you would have done this a year ago? I was curious anything in my charts that would warrant using a oximeter? And yes~! "DavePaulson" I wish someone would have said "hey you don't have to live like this" And I am sure I'm not the only one who was given a machine with no follow up! But I'm happy now. This forum is the best! 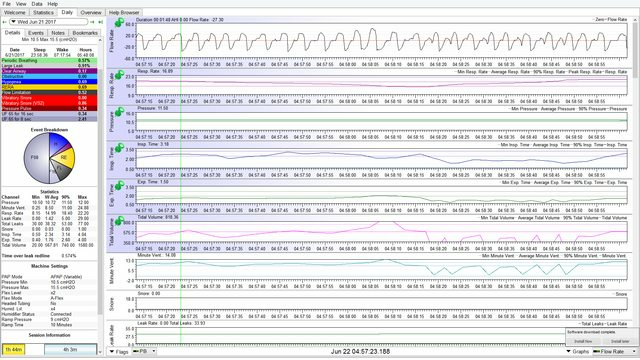 (06-22-2017, 05:41 PM)Scott C. Wrote: I was curious anything in my charts that would warrant using a oximeter? And yes~! "DavePaulson" I wish someone would have said "hey you don't have to live like this" And I am sure I'm not the only one who was given a machine with no follow up! A lot of times it's not just no follow up, it's bad follow up. Something so easy they just don't take the time or listen to you. Thank goodness for internet strangers heroes willing to help. Do you have the results of your sleep study? Your minute vent minimum is very low. Yes I do. What is the "minute vent minimum"? All they cared about was the compliance and said the machine would do the rest. And I did not know any better. (06-22-2017, 07:14 PM)Scott C.: Wrote: Yes I do. What is the "minute vent minimum"? All they cared about was the compliance and said the machine would do the rest. And I did not know any better. Minute vent volume is the volume you breath in a minute. The minute vent minimum is the lowest volume in a minute. Did they monitor O2 levels in your sleep study? looking thru the great source of all information, it can be found that the minute ventilation (MV) for an awake person at rest is usually between 5 and 8 liters per minute. in sleep, this even lowers more, depending on sleep state. in the second part of this 2 minutes you can see that sleepyhead is calculating my minute ventilation in small chucks and is sawtoothed in appearance. that is why I think my minute ventilation has such a low min value. certainly sleepyhead could have calculated in larger chunks to give the real impression of what the total air you got in the last minute (or even half minute). How do these numbers look. I used to get massive headaches on top of not feeling rested. this is why I was asking about using an oximeter. Thanks for taking a look at my numbers. This was a 1 night at home test with a monitor strapped to my forehead with a nasal thingy. Thanks QAL, I have not heard of this reading before now. Maybe those Sp02 numbers will shed some light. Still trying to wrap my head around all this.